The Volunteer Force in Derbyshire was raised in 1859 following a request to the Duke of Devonshire and as a result Derbyshire ranks sixth in the order of precedence in the Volunteer Force behind Devonshire, Middlesex, Lancashire, Surrey and Pembrokeshire. Between 1859 and 1861 individual Companies were raised in numerous Towns and Villages of the County and formed into three Administrative Battalions. However, each Company was treated as an independent unit that clothed itself without reference to the other Companies in the Battalions. 1st (Derby) in July 1859. 4th (2nd Derby) in December 1859. 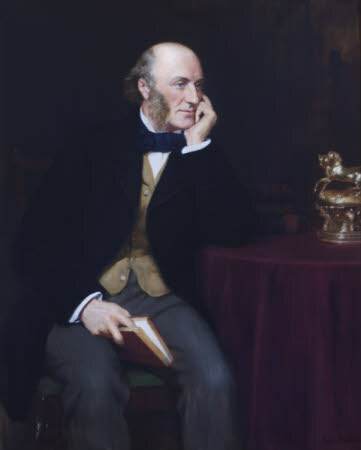 5th (Derby Artisan) in January 1860. 12th (Butterley) in April 1860. 13th (Belper) in March 1860. 15th (Chadderson) in August 1860. 16th (Erewash Valley Rifle C/ub) in September 1860 but later disbanded. 2nd (Sudbury) in December 1856 but later disbanded in 1869. 8th (Ashbourne and Dove Valley) in February 1860. 10th (Wirksworth) in March 1860. 3rd (Chesterfield) in January 1860. 6th (High Peak Rifles of Buxton) in February 1860 but later disbanded in December 1861. 7th (High Peak Rifles of Chapel-en-le-Frith) in February 1860. 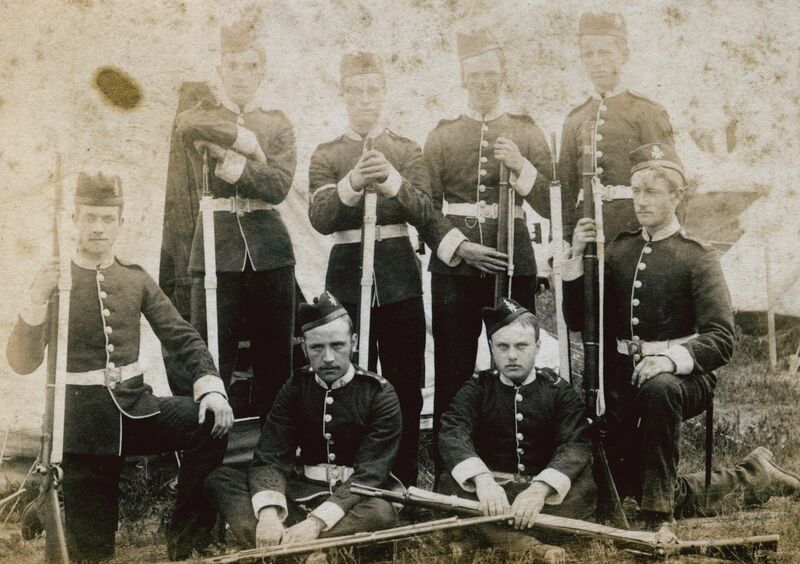 9th (High Peak Rifles of Bakewell) in February 1860. 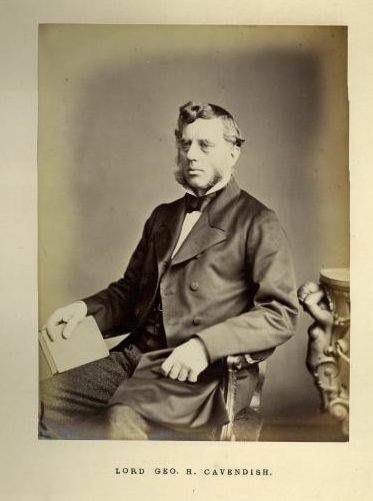 11th (Matlock) in March 1860. 17th (Clay Cross) in January 1861. 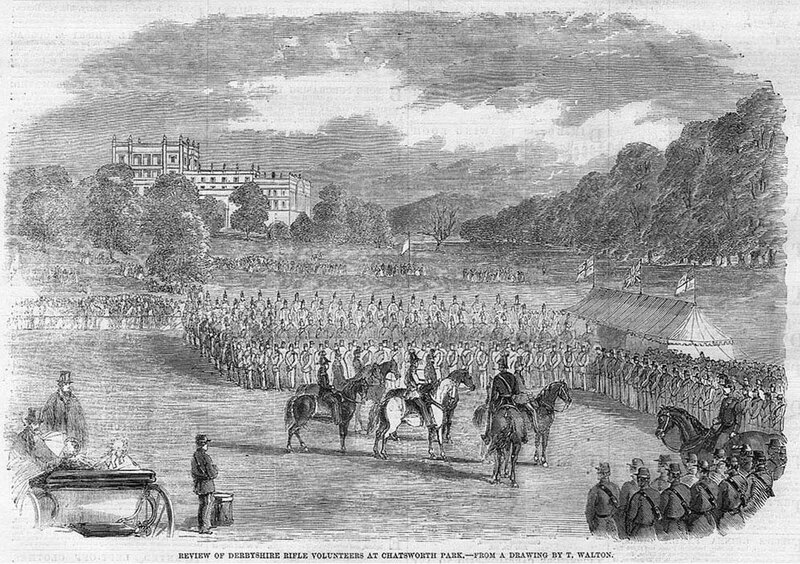 The formation of the Volunteer Force was celebrated by a review held on the 24th October 1860 that was inspected by Lieut.-General Sir George Weatheral. During the Review all three Derbyshire Volunteer Battalions were Brigaded together under Major the Marquis of Hartington, Chatsworth Rifles, the late Duke of Devonshire. 9th (Bakewell) Company of the Derbyshire Rifle Volunteers; the High Peak Rifles. 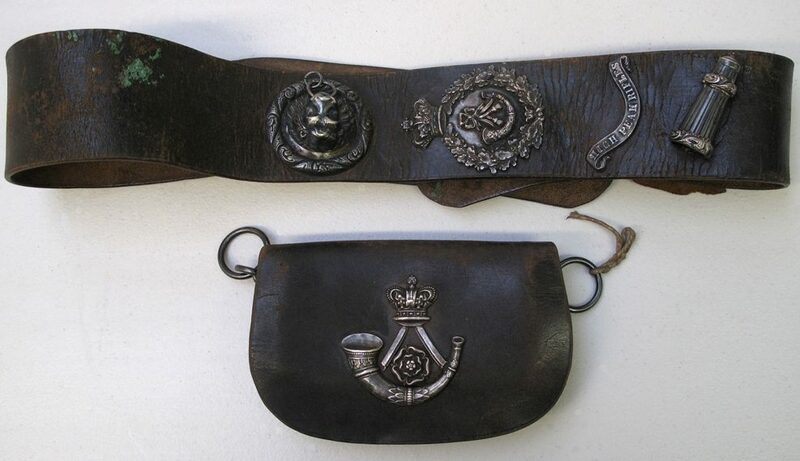 High Peaks Rifles cross belt and pouch. 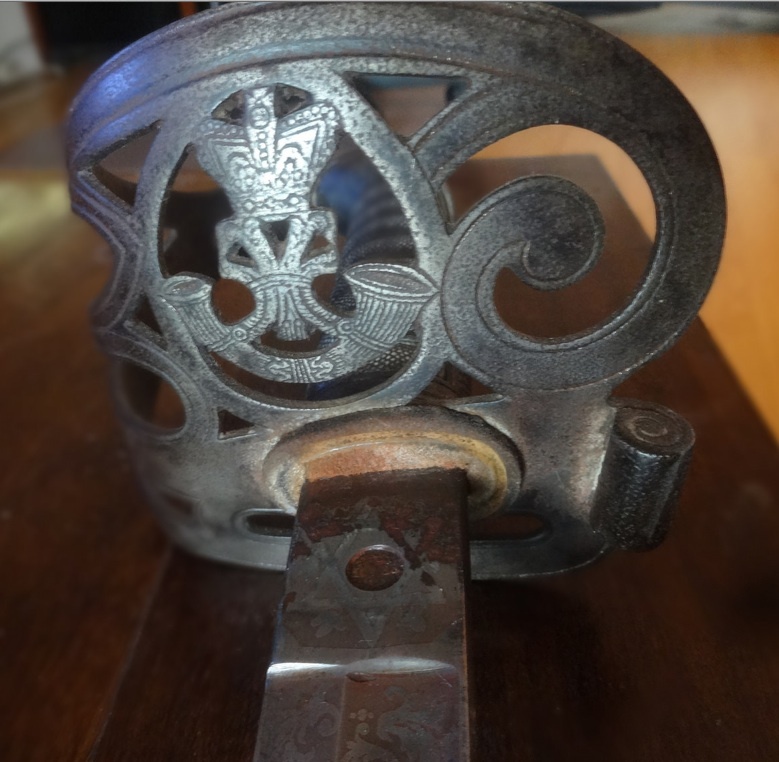 Victorian Crown strung bugle in laurel wreath, lion head boss and whistle holder; scroll with “High Peak Rifles”. For a timeline of the Derbyshire Volunteers please see Brett Payne’s excellent site – Photo Sleuth. 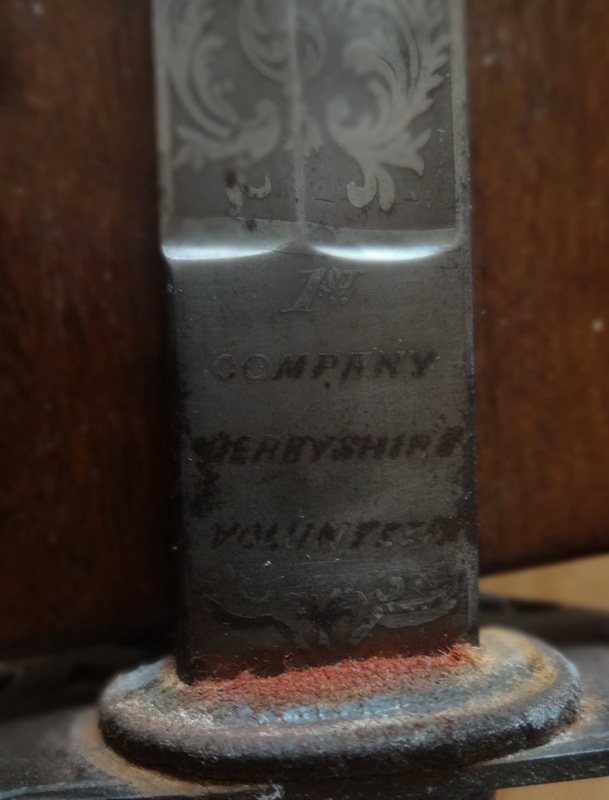 I have a Derbyshire Volunteer Rifles dress sword. Would like to send photos of engraving if you send me an email address to sent to. I have my great great grandfathers certificate of good service who resigned after 13 years in 1872. Was wondering if this was of any interest to a museum etc? Hello, does the 1911 Regimental Annual contain any of the early history of the 7th Battalion, Robin Hood Rifles, akin to its abridged history of the 6th battalion? And if so, do you by change have a digital version that can be shared? Many thanks for your assistance!